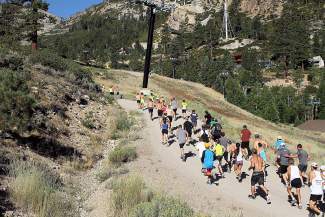 Runners begin the long haul up Mountain Run at Squaw Valley on Saturday. The 34th annual Squaw Mountain Run attracted more than 400 participants. Find a photo gallery from the event at www.macbethgraphics.com. JP Donovan was struggling to maintain fifth place near the end of a brutal Squaw Mountain Run when he managed to find another gear. 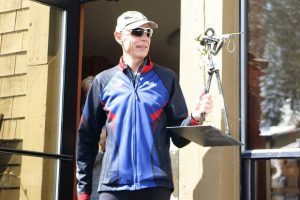 “I gave it one last shot at trying to pick off one of the top-three guys falling off the back, and I had a pretty good run on the sandy, steep section near the top and just ran through them all and got away with the win,” he said, recounting how he earned his third victory in the past four years in the annual fundraising run. 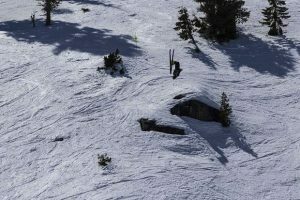 Donovan, 27, covered the 3.6-mile, 2,000-vertical-foot course from the base of Squaw Valley to High Camp in a time of 29 minutes, 28.7 seconds. He won the race in 2011 with a time of 29:52.7 and again in 2012 in 28:50.2, which remains one-tenth of a second off of the modern course record. The Incline Village resident finished runner-up last year. Regaining his title was no simple task. Donovan knew he had some stiff competition when he spotted Noah Oberriter, a to-be Truckee High senior and defending cross-country state champion, at the start. He also was aware of the prowess of Chico State cross-country runner Andrew Cobourn of Minden, as well as several “Nordic skiing monsters” from the Truckee/Tahoe area — Wyatt Fereday, Patrick Johnson and Patrick McElravey, among others. 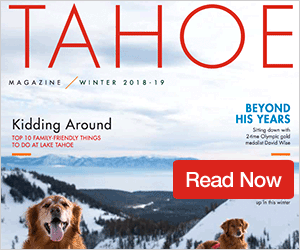 Donovan said Oberriter passed him early in the run, as did Cobourn and Patrick Parsel, a 28-year-old South Lake Tahoe resident and former cross-country runner from UC Davis. Parsel won the 2006 Squaw Mountain Run. In the end Cobourn finished second with a time of 29:43.0 and Oberriter was third in 30:07.4. They were followed by Parsel (30:25.9), Fereday (30:49.9), Johnson (31:31.7) and McElravey (33:34.7). Wilson Dippo of Olympic Valley (34:16.8) was ninth and Gustavo Johnson of Truckee (34:25.0) was 10th. Last year’s champion, Mike Sunseri of Incline Village, did not compete. Truckee 23-year-old Anja Gruber, meanwhile — who is currently trying earn a spot on the German National Nordic team — placed first among the women’s field and 16th overall, posting a time of 37:16.7. Defending women’s champ Kristin Walstad, 41, of Alta finished runner-up and 17th overall with a time of 37:50.3, and Hallie Grossman, 21, of South Burlington, Vt., was the third woman and 20th overall in 38:47.2. They were followed by 16-year-old Lindsey Adams of Gardnerville (39:43.0) and MaryEllen Benier, 57, of Truckee (39:59.3) rounding out the top five. Saturday’s event was the 34th edition of the Squaw Mountain Run, which now benefits the Auburn Ski Club’s junior programs and the Gene Upshaw Memorial Tahoe Forest Cancer Center. A total of 409 people reached the High Camp finish line, where they were greeted by live music and a post-run party. Other top local finishers included Evan Vomund and Ross McMahon of Incline Village, who placed 11th and 12th, respectively, with times of 34:50.1 and 35:15.1, as well as Truckee’s Mason Osgood (14th), Paul Sweeney (15th), Ben Grasseschi (18th) and Geoff Quise (22nd), and Tahoe City 13-year-old JC Schoonmaker (23rd). Sofia Sanchez of Tahoe Vista was the 10th woman and 47th overall. 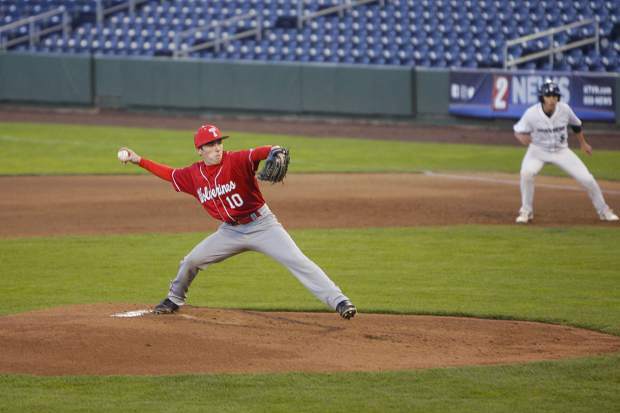 Find complete results here and a photo gallery here.